Do you love your Plano, Texas, home but wish your kitchen was larger or updated with modern features? If so, why not invest in a kitchen remodel? By renovating your kitchen to better reflect your aesthetic preferences and cater to your unique needs, you’ll be able to enjoy your kitchen more than ever before. Additionally, renovating your kitchen will likely increase the overall value of your home, making the project a fantastic investment. When remodeling your kitchen, you can fully customize the space by increasing its square footage, opening up the room to a living area for an open floor plan, and replacing your flooring, lighting fixtures, cabinets, countertops, and more. You can even have a custom kitchen island installed to add style and more cooking space. To hire a home remodeling company that can bring your dream kitchen to fruition, turn to the experienced professionals at Star Home Remodeling. We have been in the home improvement industry since 2007 and have earned a number of positive recognitions throughout our time in the industry, such as multiple Best of Houzz awards. Partnering with us for your kitchen remodel means working with a company than can handle every aspect of the renovation process, all while ensuring total customer satisfaction. We will craft the perfect design for your new kitchen, help you select the ideal products you’d like incorporated into the renovation, and build you the kitchen you’ve always wanted to have. 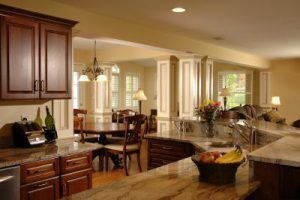 For more information about the kitchen remodel services we offer to homeowners throughout the Plano, TX, area, contact Star Home Remodeling today. We’ll be happy to answer any questions you have.